I just read a weather report that we are expecting wind chill factors of 20 to 30 degrees below zero in our region tonight. Really? I mean that is like cray cray okay? Like Arctic explorer. Like photo-of-you-and-your-sled-dogs-in-National-Geographic type stuff right there. That is like “yeah we bought a house on Pluto and have to keep the pipes dripping so the plumbing doesn’t freeze” stuff. In the mid 1980s my friend Marion got me connected with a theater in Santa Monica and I made my first trip to California. When I got out of baggage claim at LAX I thought “oh yeah I am moving here and never going back”. Fate had other plans but I spent 15 years living in Southern California gloating every winter as I called friends and family back east during snowstorms. I would make sure to take a walk on the beach every Christmas day saying “If I were back home I sure couldn’t go for a walk on the beach at Christmas!”. I would think “Thank God I don’t live in New York during winter anymore, I couldn’t handle it again” and guess what? since returning to the east coast that prophecy has almost come true! This year, I found myself as early as November 1st complaining about the temperatures, grumbling about the layers that I was having to put on on etc. and one day it hit me that it wasn’t even winter yet and I was winter whining! I decided that I really had better pace myself or I would be burnt out with my complaining before Christmas. So after an awesome trip to South Florida I decided I would go on a 1 week winter whining fast. I would not complain about the weather, grumble, eye roll, heavy sigh or sneer at the atmosphere. Well it actually worked so well but I am still on it! And it has taught me two important lessons. Lesson # 1: If you wear long johns and a face mask it is really not THAT cold. Lesson #2: Most of the stories that run our lives are just that: stories. My friend Joshua has encouraged me to look at the stories I tell myself. In particular, he got me to look at the stories I used to tell myself about my childhood “career” as a target of the bullies in school. I was picked on really badly for being “odd” and I created a whole unwritten book series of what all that meant. Titles like “There is no one Protecting me in This Life” and “I Have to See My Circumstances Get Crummy, So I Can Swoop Down and Be my Own Hero to Fix It” are some of the best loved in my collection of stories I took with me to adulthood. I had spun a LOT of yarns that didn’t serve me at all. It has occurred to me that most of our opinions or outlooks on life are just campfire stories where we are the audience AND the storyteller. So much of what we know to be true is simply a very personal truth. So then we have to say is it REALLY true? I think for something to pass the test of being TRULY true it needs to be 100% continuously, absolutely true. If not then we are just messing around with the English language. 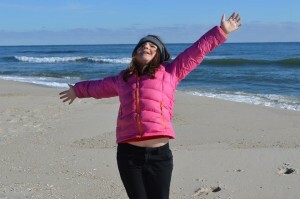 My daughter Maitreya doesn’t whine or complain about the cold. She thinks it is beautiful and fun. Snow is DELICIOUS. So truth or story? There is nothing wrong with telling ourselves complaining, whining stories but I think we owe it to ourselves to call that what it is. If we walk around calling our personal story “truth” we are crafting a unreality for ourselves that seems real as it quietly shapes our choices in work, relationships and health etc. Our stories create our circumstances and our very life itself in a real and tangible way. What personal story do you carry around as truth?